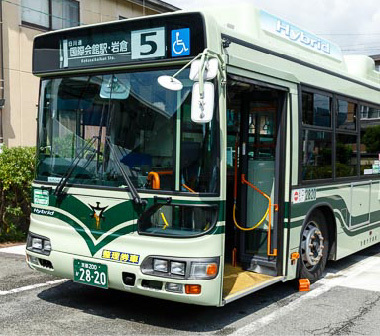 Kyoto buses operate from approximately 06:00 am to 10:00 pm, though some run earlier or later depending on the route. At the Kyoto Station Bus Information Center you can get bus maps, buy tickets, and inquire about additional travel information. We recommend you ask an officer at the bus station or police box if you cannot find your destination or if you got lost. If you plan to be traveling by bus a lot, visit our Day Pass Tickets page for information about convenient day passes. All buses have machines that will change 1,000 yen bills to coins. Note: Larger bills cannot be changed. Before getting off, put your fare into the coin slot. If you have a bus pass, insert it into the green card slot. Make sure to take your pass when you exit the bus. Exit from the front of the bus. When you get on the bus, take a number from the machine by the door. When you are approaching your destination, press the stop button. To determine your fare, check your number and look at the display screen at the front of the bus. Before getting off, put the money and your number slip into the machine next to the driver's seat to pay your fare.